As far as we can tell, Saint Gobnait lived in sixth century Ireland. In English, her name is Abigail or Deborah, which come from her association with bees. An angel told Gobnait to search for the place she belonged by looking for nine white deer. She traveled all around until she saw nine deer grazing on a hill in Ballvourny, County Cork. She settled there, built a monastery, and established a religious order. She also kept honey bees, which was a sacred insect in Irish lore. There are numerous legends and stories surrounding Saint Gobnait, but even among these fantastical tales, it is remembered that she helped the sick and poor, extending her kindness to anyone in need. She used honey from her beloved bees to comfort and heal the sick and wounded. The more colorful stories include her setting swarms of bees on unwanted invaders, knocking down an entire castle being built by squatters on her land with a stone ball and protecting her village from the plague by drawing a line on the ground with her staff and declaring the village sacred ground. The ruins of her church, monastery, her grave and wells that bear her name, are sacred sites of prayer still visited by thousands. A medieval statue of Saint Gobnait is brought out every year on her feast day for faithful pilgrims to touch and wrap ribbons around to take home. 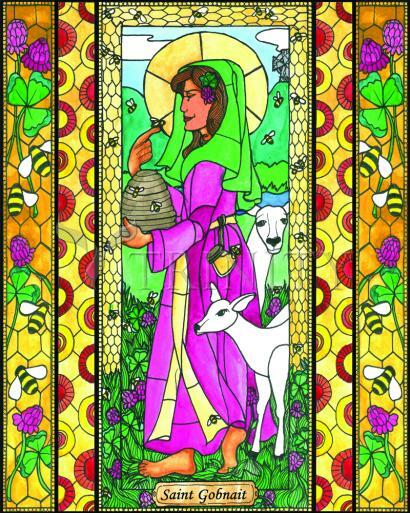 She is invoked for healings of all sorts and the trees near her wells are covered with rosaries and other religious trinkets and gifts to thank the Patron Saint of bees for her consideration of hundreds of special requests. Saint Gobnait’s Day is Feb 11th is still celebrated by the community of Ballyvourney, in County Cork. During a Mass at the well, everyone takes water from it. Monasteries and oratories in Gobnait’s time would have resembled stone beehives….